So far, most episodes of The Mindy Project’s sixth and final season have landed on really strong endings. “The Midwife’s Tale” is no exception. But as with other recent episodes, those endings seem narratively disconnected from the rest of the episode. Though it sharply touches on some of the ideas at the center of this season—namely that romance isn’t as straightforward, linear, or cogent as Hollywood makes it seem—“The Midwife’s Tale” is all over the place in its storytelling. When Tamra asks her coworkers for advice on whether to accept Morgan’s marriage proposal or not, Mindy tells her that it would be much easy for them to tell her to take the romantic route and hard for her to live with the consequences of that decision if it wasn’t what she really wanted. It’s a bold statement, especially since it comes from Mindy Lahiri, queen of romance. The Mindy Project has continually challenged starry-eyed rom-com philosophy. Mindy’s divorce from Ben has changed her perspective of romance. Of course it’s easy for people to tell you to do something romantic. It’s harder to look at major life decisions with a wider, more practical lens. Now, her big speech would hit a lot harder if Tamra actually listened. Instead, she does take the romantic route and decides to marry Morgan, who only proposed because Brendan Deslaurier accidentally revealed that he was the father. Tamra and Morgan’s storyline this season has felt very redundant, and at least she didn’t give in and tell him he’s the father willingly. The accidental reveal somewhat disrupted their back-and-forth pattern of Tamra pulling away and then coming back to Morgan. But then the pattern’s right back in place when she agrees to marry him. It just takes some of the weight out of Mindy’s uncharacteristically emotionally mature speech. Presumably, Tamra decides to be with Morgan because it’s what she really wants, but I’m just not totally convinced of that turn based on what’s laid out in the episode and in previous episodes. The Mindy Project doesn’t quite earn this romantic ending, which makes it feel exactly like the kind of empty, fluffy rom-com conclusion that the show is trying to upend. The conversation between Mindy’s and Deslaurier at the end is similarly emotional and touching, but the build-up isn’t quite there, making it feel a little out of left field. Brendan Deslaurier joins the practice after Morgan and Mindy save him from attempting suicide. His brother has gone full corporate (after watching Frozen, which is hilariously absurd) and is pushing him out of the business. Deslaurier’s short-lived position at Shulman & Associates is mostly just a setup for the writers to work in lots of jokes about his new age lifestyle. Those jokes about the specifics of Deslaurier’s life philosophy always land much better than the jokes about traditional medicine versus midwifery. Deslaurier calls donuts “do nots” and says that chairs are the new cigarettes. It’s all funny enough, but there’s little to no build-up for his eventual conversation with Mindy at episode’s end, when he says he was sad to see her replace her romantic spirit with straightforward practicality. It’s a fascinating character moment for Mindy. She displays character growth, but there’s also an acknowledgement that she has lost an important part of herself. That kind of nuanced character development isn’t something we get a lot of on The Mindy Project, a show populated by rather static, one-note characters. But the fact that the realization comes from Deslaurier reads as forced and false. I often think of Jane The Virgin when watching The Mindy Project. Though they are tonally and structurally very different shows, in some ways, they’re trying to do the same thing. Jane The Virgin works to upend the telenovela genre, eschewing romance tropes even as it buys into the ideas of true love and fate. 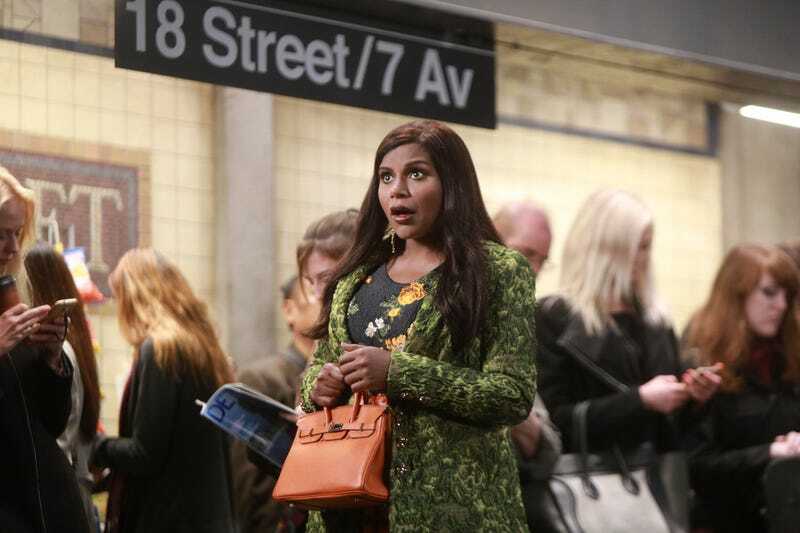 The Mindy Project is trying to do the same thing with the romantic-comedy genre. Mindy’s voiceovers are often on-the-nose but illuminating, much like the narration provided by the Latin Lover Narrator in Jane The Virgin. But The Mindy Project is less effective in its challenging of tropes, and it’d be overly simplistic to just blame that on the fact that the show is more explicitly a comedy than Jane The Virgin is. The Mindy Project rarely surprises. It follows rom-com conventions more often than not, and when it does manage to challenge the genre, it does so in broad strokes that are disconnected from the rest of the show’s narrative. The Mindy Project often has something interesting to say but doesn’t know how to say it. I’m so annoyed by the whole Mary/Jody storyline already. First of all, Ana Ortiz’s comedic talents remain completely untapped. Second of all, Jody is still a horrible person and I just don’t buy that Mary would be interested in him even before she asks around about him. 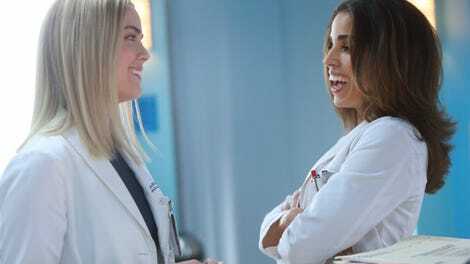 Third of all, Ortiz has more chemistry with Rebecca Rittenhouse. My favorite subplot in the episode is Anna’s new obsession with office gossip. “I am Moana” got a big laugh out of me.